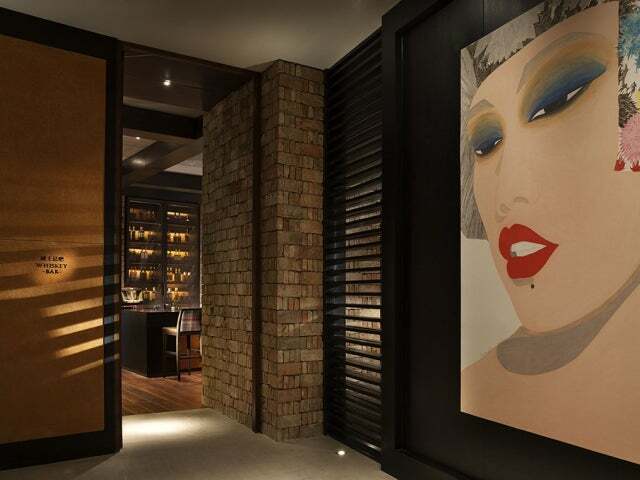 A swanky bar with views of Beijing's bedazzling lights, MEI is heaven for those who appreciate the finer things in libation life and having a good time. In a city overflowing with posh cocktail dens aiming to overflow your glass with premium spirits and champagne, MEI is the latest entry into this pageant of beautiful bars. Featuring a vast selection of premium whiskey, wine and assorted cocktails made by a master mixologist who has been belied with accolades, MEI is making its best effort to stand out from the crowd, and it’s succeeding. Located inside the regal Rosewood Hotel, MEI makes a fantastic first impression with meticulously placed brick fittings, multiple modern fireplaces, wooden floors, and bold portraits. There are actually three distinct bars within MEI, with the venue playing host to a cocktail bar, whisky bar, and wine bar, and the latter has an outdoor terrace that offers sweeping views of the city on nice days. When it comes time to order a cocktail at MEI, you will find a menu full of drinks made with both international flavors and Asian twists like the Pisco Punch – premium pisco and bitters, apricot flavored brandy, pineapple puree, lime and garnished with a strawberry marshmallow – and Mango Hemingway Daiquiri – ultra premium white rum, cherry liqueur, passion fruit, lemon, vanilla, and foam tinged with mango puree. The wine and whisky selections at MEI follow suit, and are best enjoyed to the sounds of the lively bands and DJs that entertain until the small hours.